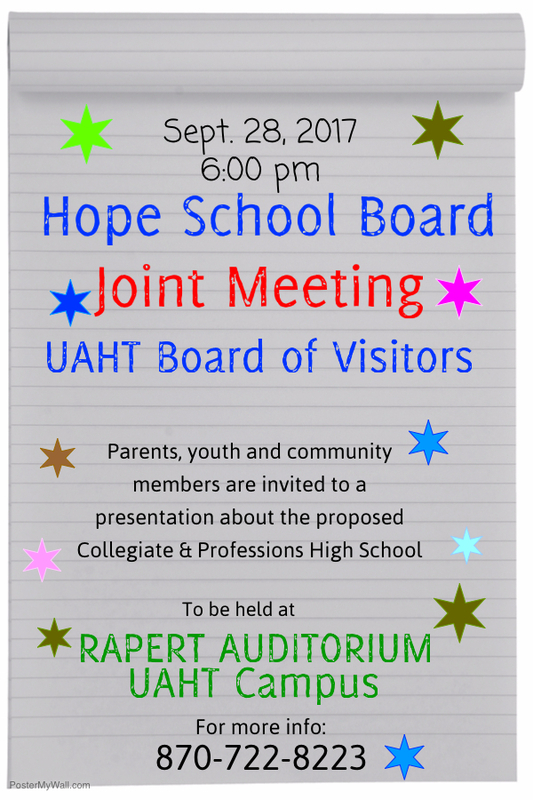 HOPE – The Hope Public Schools Board will meet in a called session Thursday, Sept. 28, at 5:30 p.m. in the auditorium of the Johnny Rapert Library Complex on the University of Arkansas-Hope campus. The agenda includes consideration of a 2017-2018 fiscal year budget for the district. The meeting is open to the public. The board will meet in a joint session with the UA Hope-Texarkana Board of Visitors at 6 p.m. in the Rapert Complex auditorium to begin formal discussions regarding a conversion charter grades 10-12 collegiate and professions academy to be located on the UA-H campus. That meeting is also open to the public. The Hope Collegiate and Professions Academy will join aspects of the missions of the HPS and UAHT in a direct collaboration that creates a standing student body to be housed in the Rapert Library Complex on the UA-Hope campus. The program will also integrate the service learning model developed through the Clinton School of Public Service in Little Rock for the Hope Academy of Public Service into its concept.